OUO has provided decades of top-class opportunities to players at the University of Oxford, impressing audiences from the University community, Oxford area and beyond. The orchestra is the flagship ensemble of OUMS and, as such, its instrumentalists are selected from the very best that the University has to offer, including a large number of former members of the National Youth Orchestra and BBC Young Musician of the Year finalists. To complement these extraordinary talents, OUO is conducted by a professional conductor and regularly uses professional soloists. Recent conductors include Daniel Harding, Peter Stark, Douglas Boyd, Jason Lai and Garry Walker. As soloists, OUO has showcased Steven Isserlis, Anthony Marwood, Simon Preston, Raphael Wallfisch, Guy Johnston and Thomas Trotter. 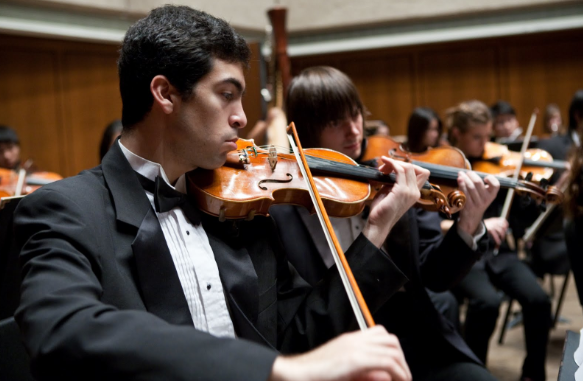 In the last few years, the OUO has featured Shostakovich’s Tenth Symphony, Mahler’s Fifth Symphony, Bartok’s Concerto for Orchestra, Messiaen’s Turangalila Symphonie, and Stravinsky’s The Rite of Spring. OUO has provided decades of top-class opportunities to players at the University of Oxford, impressing audiences from the University community, Oxford area and beyond. The orchestra is a flagship ensemble of OUMS and, as such, its instrumentalists are selected from the very best that the University has to offer, including a large number of former members of the National Youth Orchestra and BBC Young Musician of the Year finalists. To complement these extraordinary talents, OUO is always conducted by a professional conductor and regularly uses professional soloists.